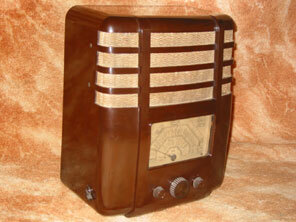 Pictured is the UAW69 receiver. It is housed in a large bakelite cabinet, but rather less striking than some of the earlier bakelite cabinets produced by Ekco. This cabinet was from an in-house designer rather than a commission offered to a contemporary general designer, so is rather more conventional than say the AC97 or AD65. That said the cabinet does seem to be “streamlined” to a degree, in that the front of the receiver slopes gently backwards similar to steam locomotives such as the Mallard. Even so, plain as the UAW69 may seem, it is still far more adventurous than the bakelite cabinets from other manufacturers of the era. 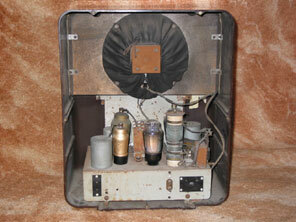 (As a case in point Cossor produced receivers in bakelite cabinets, but the bakelite cabinets were often exact copies of their wooden equivalents). The circuit is an unremarkable “short” superhet, featuring an output valve that also included a double diode. As this receiver is suitable for DC mains as well as AC mains a substantial wirewound mains dropper is included. Even though the cabinet is quite large the heat generated from this dropper is substantial, and the card back incorporates a metal “chimney” to direct the heat away towards the ventilation slots at the rear of the cabinet. The receiver cost only £9.9.0 in 1938, which was really quite competitive. The set certainly looks impressive, being 18” x 16” x 9”, but money has been saved elsewhere. For instance, instead of a multicoloured screen printed glass tuning scale, the stations are printed on ordinary card illuminated by a single bulb, the whole dial being protected by a piece of clear plain glass.